Built for tough, versatile mass transit, the 0500 Transport Case is designed to fit two cases to a 42" x 48" pallet and features more than 16,000 cubic inches of usable storage space. The case' robust design also allows for them to be stacked one-level high for a total of four cases in one load. The 0500 also sports two integrated automatic pressure equalization valves that keep moisture out and prevent vacuum lock so the case is easier to open at any altitude. Two small over-molded handles are included on its fully-removable lid, while two double-wide grips designed for team lifting are featured on the base. 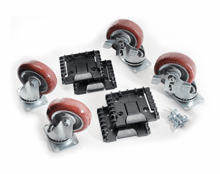 Optional available features include Pick 'N' Pluck foam, heavy duty caster wheels and detachable pallet risers for easy forklift transport. Also available is a manual pressure equalization valve and humidity indicator for moisture regulation which can make the case perfect for storing sensitive electronics, weapons or anything else that requires strict atmospheric conditions. Additionally, the 0500 can serve as a mobile equipment cover, rolling equipment storage cart or conventional case. 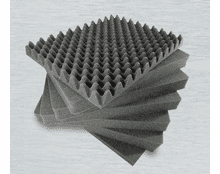 Its removable lid can serve as a platform for stationary equipment such as compressors or engines, while the deep part of the case becomes a cover when the case is used upside-down. 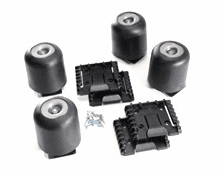 Ports are designed on both the top and bottom to accept brackets for either caster wheels or pallet risers. Like all Pelican Protector Cases, the 0500's open cell-core wall, polymer construction protects sensitive equipment from some of the harshest conditions on Earth. Additional standard features include a removable 4" x 6" clear identification document holder, a lid equipped with a polymer o-ring for a dust and waterproof seal and dual action latches that have been tested to withstand nearly 400 pounds of pressure (but open with a light pull). 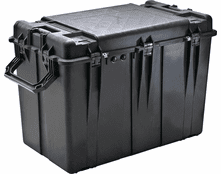 Genuine Pelican Protector Cases are fully stack able for optimal space efficiency and can always be spotted by their distinctive, trademarked "Dual Band" design. Fit two 0500 Cases per pallet, four when stacked! Due to the physical size of this case, we ship them direct from the manufacturing facility to the customer to keep the cost down. 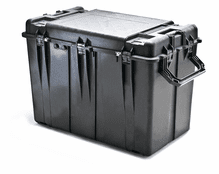 Pelican-Case will process the order the same day with the manufacturing facility, but it may not ship the same day. We highly recommend you have the larger cases ship via ground, as they are very expensive to ship air freight. Lid Layer 1 2.25" Convolute, Base Layer 1 .05" Pad, Base Layer 2 4.50" Diced, Base Layer 3 4.50" Diced, Base Layer 4 4.50" Diced, Base Layer 5 4.50" Diced, Base Layer 6 4.50" Diced. NOTE: Due to the size & weight of this case, UPS may charge additional shipping. Online orders sometimes do not show the total shipping costs. If you would like a quote with exact shipping cost please email our sales department.